Tuesday 28 January. The weather gods were kind to us today as we set out for the 3rd leg of our Nar Valley Way walk. This section was 10.4 miles from West Acre to Wormegay using the line of the trail as currently shown on OS maps. 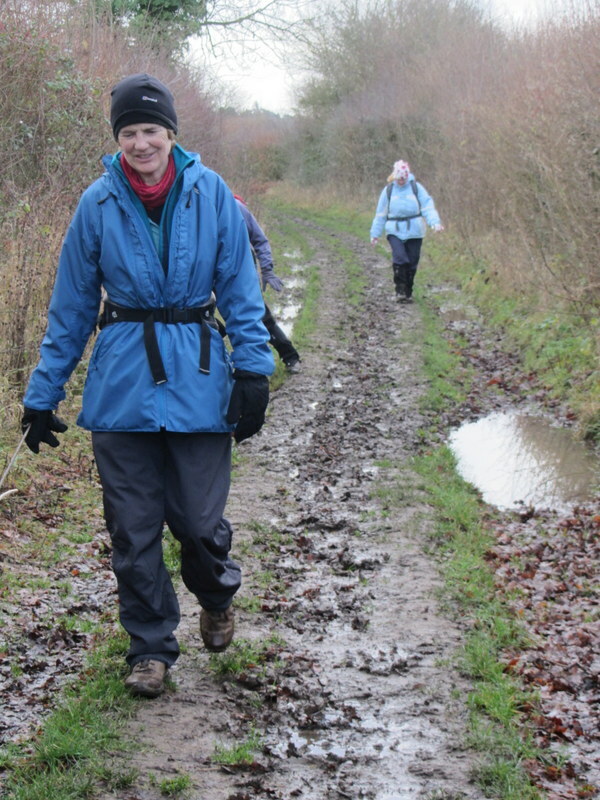 Despite all of the recent rain, the majority of the route was in good condition with only a few very muddy bits. The section through Bradmoor Plantation was particularly attractive and it was here that we joined the course of the River Nar which we followed into Narborough. The crossing of the A47 was interesting with the option of a 3ft high tunnel alongside the river or a gamble with the traffic whizzing by overhead. The latter won out and we didn’t have to wait very long for a suitable gap in the traffic. The section leading out of Narborough was very familiar to us as we’ve done this many times on group walks. We stopped for lunch at the sluice just north of Marham Fen and then went to have a look at what remains of Pentney Priory. The last time that we visited, the landowner virtually chased us off as we had wandered all of 20 yards away from the permitted right of way. Things have deteriorated considerably since then with a sign having been erected to ward unwelcome visitors away or to agree to a £5 entrance fee. I doubt that we’ll bother to come back again. Retracing our steps back to the River Nar, it was here that we detoured from the amended route of the Nar Valley Way and made our way on the old route through Shouldham Warren. Whilst I appreciate that the amended route stays true to the course of the river, it is very much the same as the previous 3 miles and the Shouldham Warren path offers a wider variety of scenery. It was only a mile or so from Shouldham Warren back to the car parked in Wormegay. A most enjoyable and dry day. This entry was posted in Uncategorized on 28/01/2014 by fenlandramblers. Tuesday 21 January. 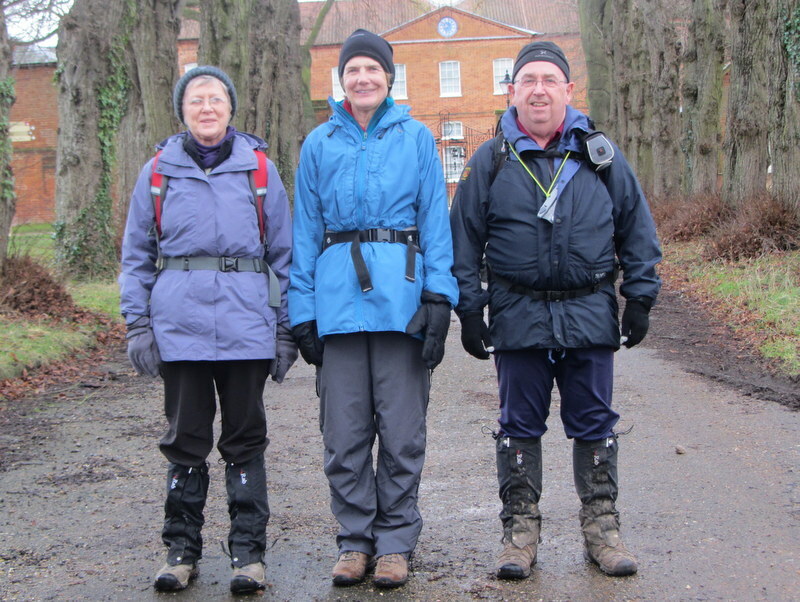 Four of us met up again for the second leg of the Nar Valley Way from Litcham to West Acre. A foggy and frosty drive to the start didn’t bode well for the day ahead but the mists soon cleared leaving sunny skies, however, it was still a little on the chilly side. The walk through Litcham Common was boggy in places but the frost on the hedgerows provided great photo opportunities. We stopped for coffee at the East Laxham buttercross. Resuming the trail we followed the Nar Valley Way fingerpost heading west out of East Laxham but by the time that we had walked a third of a mile and reached Street Farm I realised that, despite the signpost, this wasn’t the route of the Nar Valley Way as shown on the Ordnance Survey map. So we retraced our steps back to East Laxham to pick up the true route of the Nar Valley Way heading north from Church Carr to make a minor detour to East Laxham church and also to visit West Laxham church before joining up again with the signed route just before crossing the A1065. I can’t really understand why Norfolk County Council has made a change to the route of the Nar Valley Way from that shown on the OS map. This is confusing, misses out on the chance to visit the churches at East & West Laxham and is compounded by the fact that there is also a sign for the Nar Valley Way on the roadside at the southern end of West Laxham. I can only think that Norfolk CC believe that “their route” follows a slightly quieter country lane but to my mind, it is a pointless and less attractive diversion. We stopped for a late lunch at the Ostrich in West Acre where I had a swift half and a bowl of chips. Refuelled, we then made our way to the finish at West Acre. This section of the route is always boggy in the winter time and today was no exception although I have seen it worse. The mists came down again during our lunch break, which was a shame, but it didn’t spoil what had been a most enjoyable 10¼ mile walk. This entry was posted in Uncategorized on 21/01/2014 by fenlandramblers. Sunday 19 January. 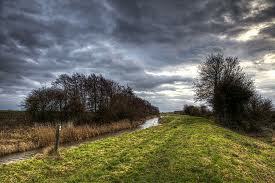 A weather front was slower than forecast in passing through our area so the drive to Stoke Ferry was a wet one. Had I not been leading the walk then I would have turned around and gone home. However, by the time that I got to Stoke Ferry the worst of the rain had blown through and I was surprisingly joined by 9 other members of the group. The planned route had been changed as it was too boggy so we set out for a 7½ mile walk with the option of cutting it short in the event of the weather turning bad again. Our coffee stop at the 2½ mile point was taken in the dry but shortly afterwards it started to rain heavily and the consensus opinion was that, instead of walking around Stoke Ferry Fen, we should take the short cut across the middle. Although the rain didn’t look as if it would stop anytime soon, it only lasted for about 20 minutes and it was dry again by the time we stopped for lunch at the bridge across the Cut-off Channel. This is one of many drainage systems which, along with the River Wissey and the Great River Ouse all come together at Denver Sluice before flowing out to The Wash.
A short post-lunch walk took us back through Wretton and back to the cars to complete a circuit of just 6 miles. This entry was posted in Uncategorized on 19/01/2014 by fenlandramblers. Thursday 16 January. After the thunderstorm of last week and the aborted start to the Nar Valley Way, we were blessed with a mild sunny day. 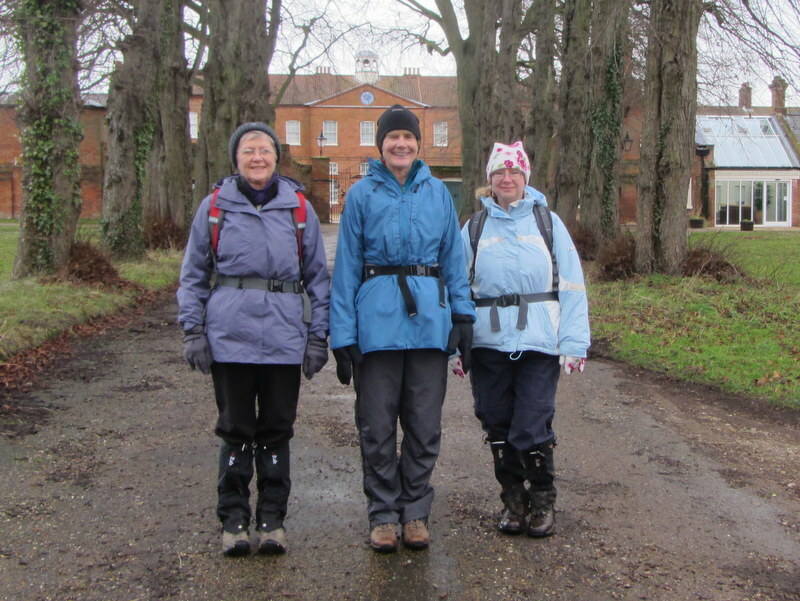 Bea, Josephine and I met Karen at Litcham and then drove to the Gressenhall Museum to start the first leg of this 33 mile trail. Although the museum and café were closed, we were able to make use of the toilet facilities, after which there was the taking of the obligatory start of walk photos. 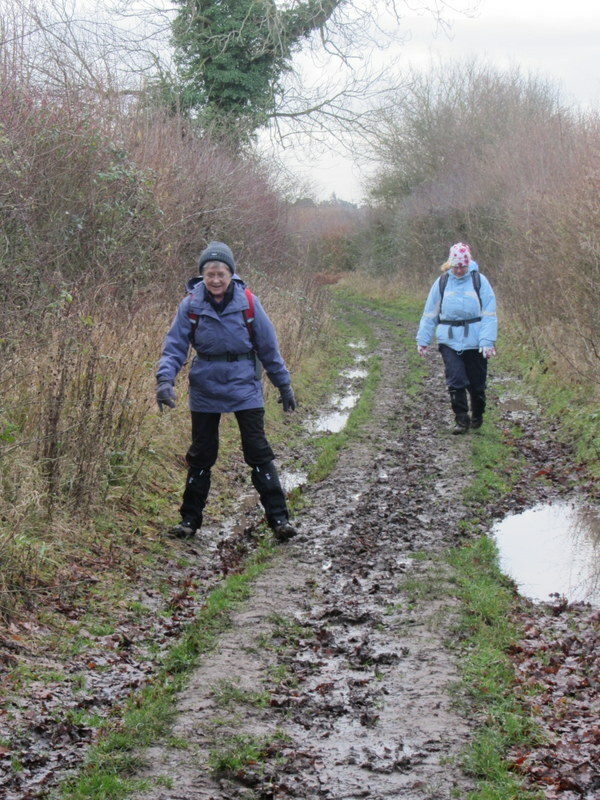 It took a little while to escape the pavements of Gressenhall but the bridleway at Manor Farm came as something of a shock with its muddy quagmire conditions. We slithered to the top and then followed Stony Lane into Bittering where we stopped at the old church for coffee. Laeving Bittering we encountered a couple of muddy cross-field paths which lead us to Rudd’s Drift and into Mileham. It was here that we stopped briefly to admire a newly built 5 bedroom detached house in Earlsmead Gardens. 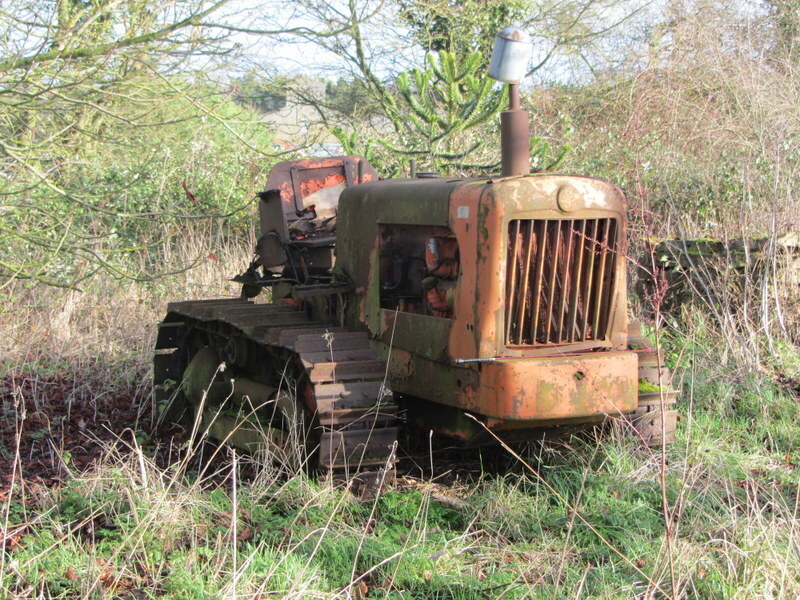 A subsequent search on the internet revealed that it is on the market at £695k. A lovely house but outside our price range unless one of us wins the lottery. There wasn’t a really good lunch spot in Mileham so we pressed on for another half mile or so before stopping in the countryside just north of the village. A loop around Lounds Wood and Grenstein Grove brought us back onto Mileham Road and then on field-side paths to join the B1145 Litcham Road. 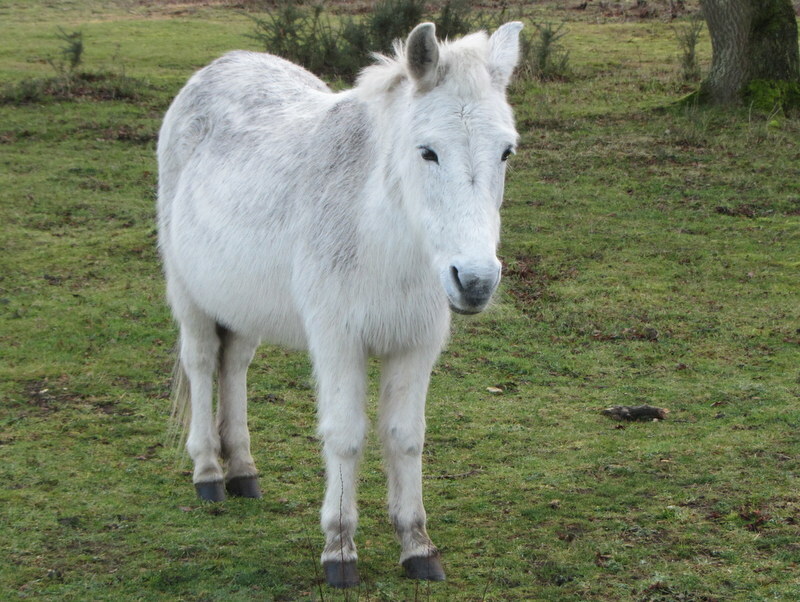 A short section of road walking then took us to Drury Lane and back into Litcham and on to the car park at Litcham Common where the wild ponies were waiting to greet us. 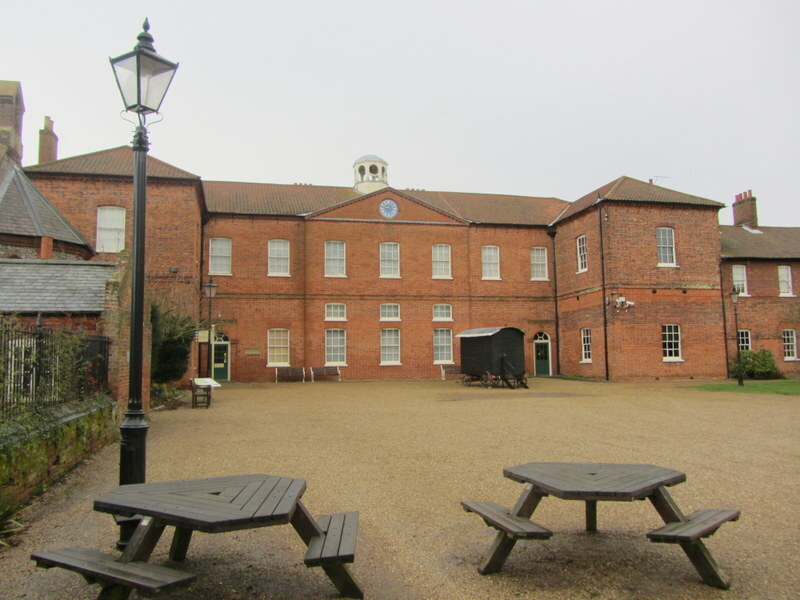 Karen then drove us back to Gressenhall so that I could pick up my car for the journey home. A signpost at Litcham Common suggested that it was 8¾ miles to Gressenahall. This was somewhat at odds with my GPS which recorded our walk from Gressenhall at 9.85 miles. Although we all like to walk in the countryside, we felt that we hadn’t really started the trail until the 8 mile mark when we crossed a bridge over the River Nar. 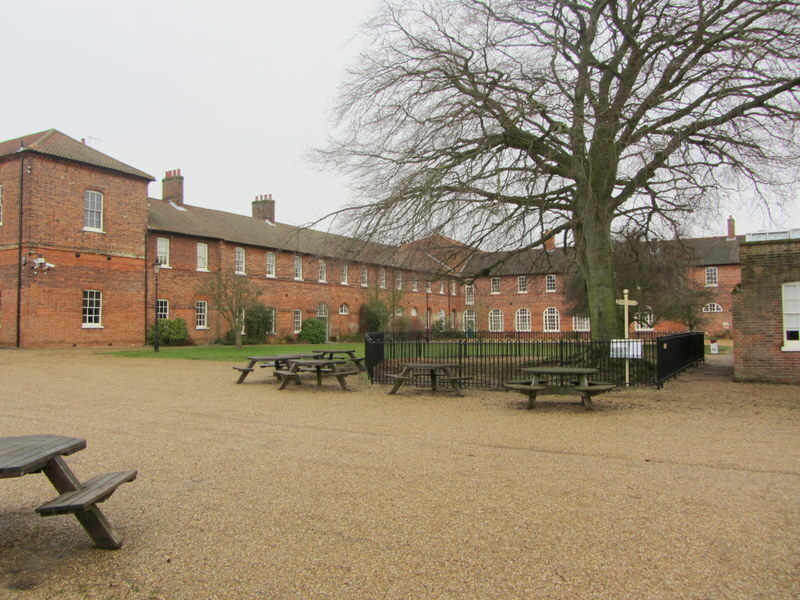 Perhaps the trail was started in Gressenhall rather than Litcham because of the facilities offered in and around the museum. Despite this, we all enjoyed a fine day and look forward to the second leg from Litcham to West Acre when I’m sure that we’ll see a good deal more of the River Nar. This entry was posted in Uncategorized on 16/01/2014 by fenlandramblers. Sunday 12 January. 10 members of the group gathered on a crisp and clear morning for a 7.7 mile walk from Little Walsingham. This was the first walk lead by Linda and her efforts are greatly appreciated. A path along the route of the disused railway line took us to the Slipper Chapel for a toilet/coffee stop. A series of small country lanes then lead us to the church at East Barsham where we stopped for lunch. From here we followed yet another small country lane to Great Snoring. The hard surfaces may not have been ideal but we soon discovered that venturing further into the countryside brought with it the drawback of muddy paths. The green lane leading back to Little Walsingham had been churned up by either agricultural vehicles or 4×4’s but we were able to avoid much of this by taking to adjoining fields. A short section of road then took us back to the cars. This entry was posted in Uncategorized on 12/01/2014 by fenlandramblers. Saturday 11 January. The weather over the last few weeks has hardly been seasonal with no sign of snow and very few frosts. Instead, we’ve had regular wind & rain which has made underfoot conditions very soft and muddy. 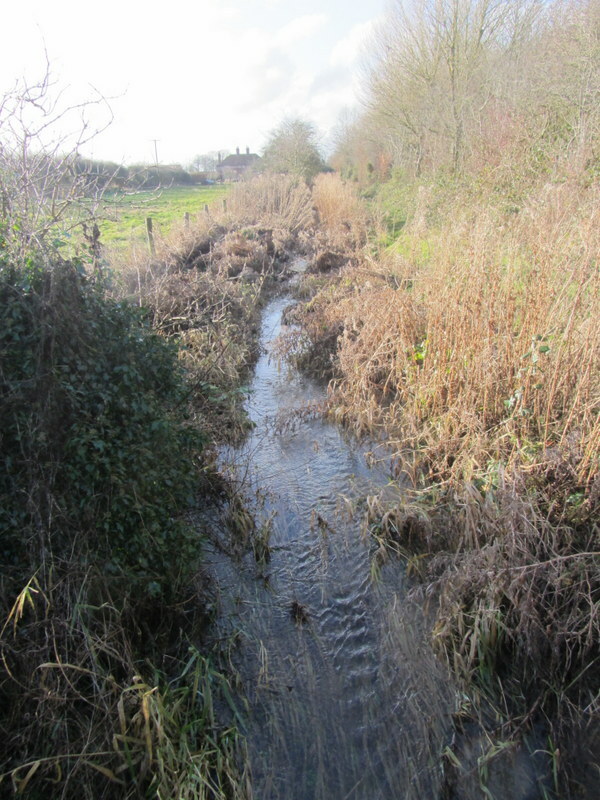 The tidal surge before Christmas washed away part of the shingle sea defences at Cley next the Sea and has meant that the planned walk from there on 23 March will have to be re-routed inland and along the Glandford valley. The crash of the American helicopter was a sad event and has brought a temporary closure of the surrounding area. I’m sure that this will be resolved before our walk. 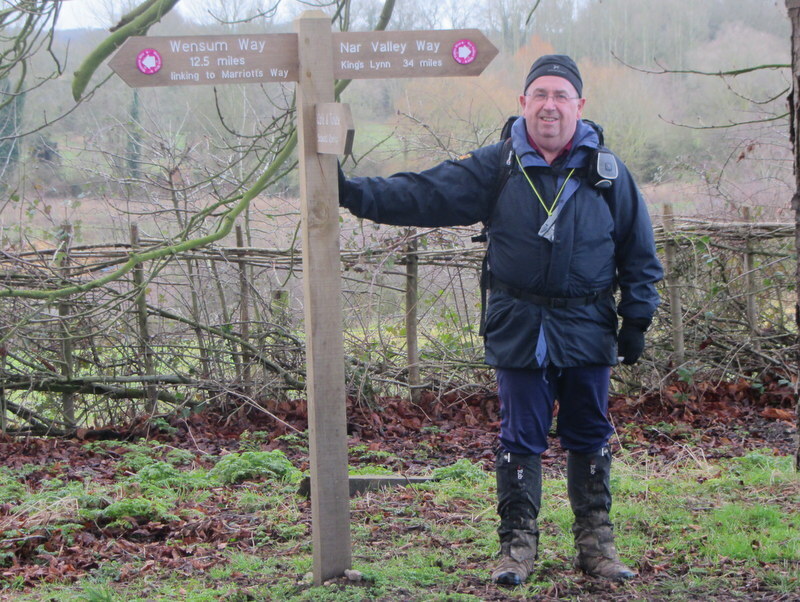 As I’ve said, the ground is very muddy as I found out yesterday when I went to recce my Southwick walk for 9 February. It was so wet that I’ve decided to do an alternative route but some mud is inescapable. 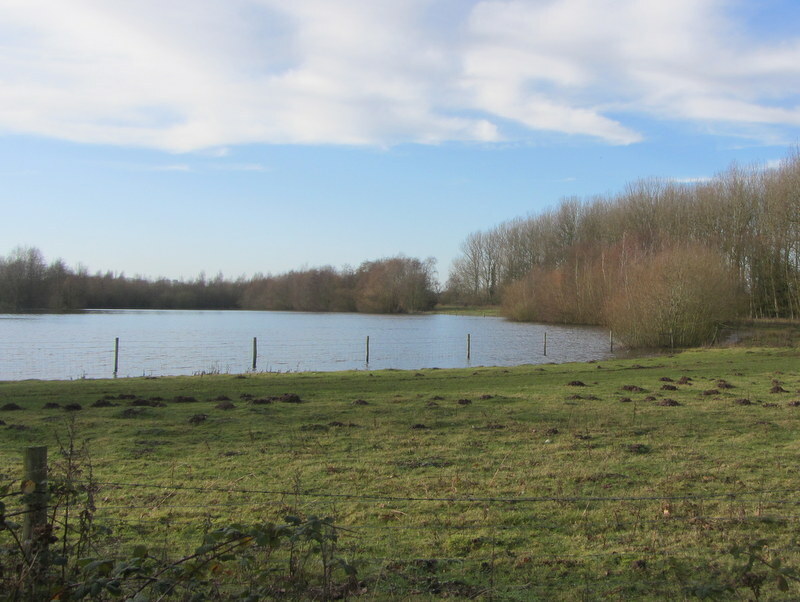 Bea and I went out on 8 December to recce the Stoke Ferry walk that I’ll be leading on 19 January. A large part of the route had been churned up by cattle and I’m sure that it will be even worse by now. With this in mind, I revisited Stoke Ferry again today to try out an alternative route which was a complete circuit of Stoke Ferry Fen. It proved to be a much better and relatively dry route although a mile and a half longer than the intended 6 miles. A shorter 5¾ mile route would be possible if the weather turned out to be inclement on the day. The sugar beet factory was almost constantly in view but this was compensated for by sight of a herd of deer less then half a mile away from my route. This entry was posted in Uncategorized on 11/01/2014 by fenlandramblers. Tuesday 7 January. 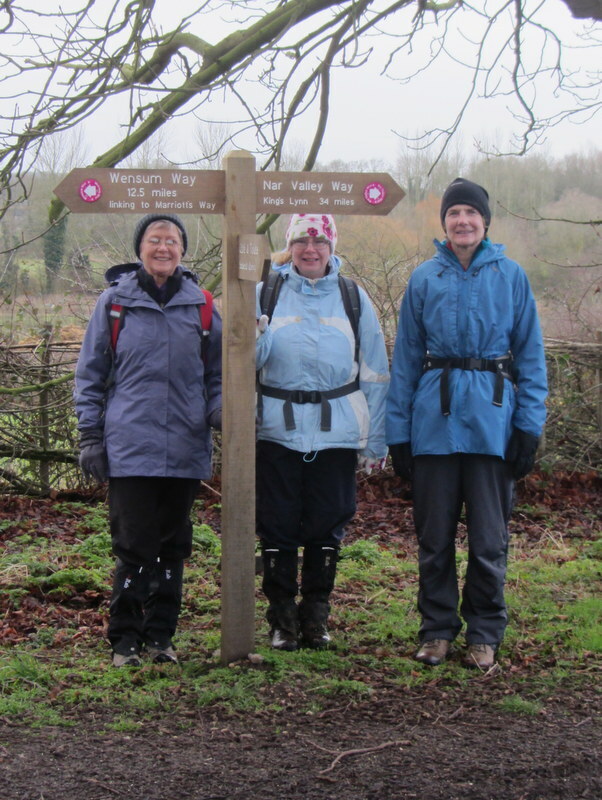 Karen, Bea, Josephine and I had planned to start the Nar Valley Way today but the weather was of a different mind. The forecast for the last 24 hours constantly changed but we were supposed to expect showers which would clear throughout the morning. This was sufficiently encouraging for us to make the 50 mile drive to Litcham to meet up with Karen and then to go on to the start of the walk at Gressenhall. There were light showers on the way there, but by the time that we arrived at 10am it was bucketing it down with claps of thunder. It didn’t seem as if this would improve very much so we abandoned the walk and made for the tea shop in Castle Acre which we subsequently found to be closed. Luckily, the Ostrich pub was open so this provided so refuge from the elements. 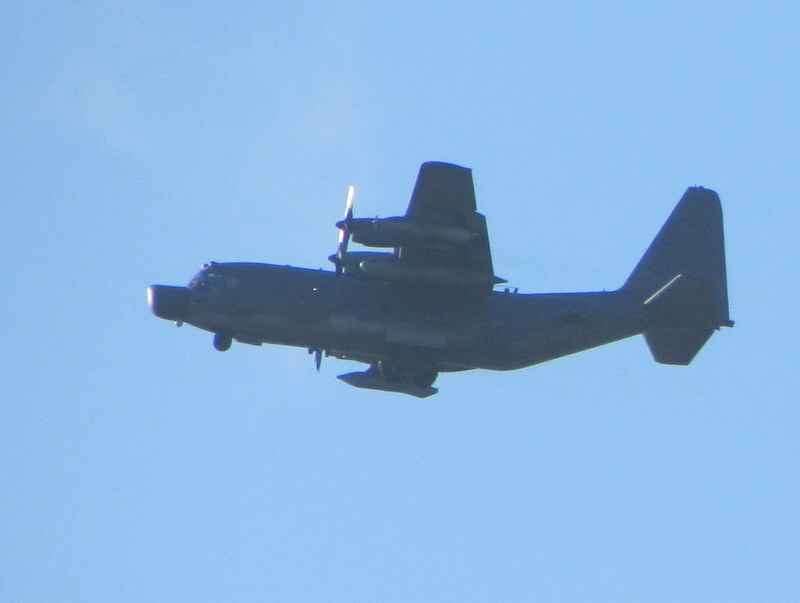 By the time that we left at about 11am it had stopped raining and there were patches of blue sky. An eventful morning wasn’t quite completed as the road south out of Castle Acre was flooded by the River Nar, meaning that we had to double back on ourselves and exit via the road towards Newton. This entry was posted in Uncategorized on 07/01/2014 by fenlandramblers.